As many of you know Lewis received a kidney transplant at Duke Medical Center in 2005. Since then he has had two hernia surgeries and prostate cancer. We are happy to report that in spite of the setbacks he is doing well. He loves spending time with his four children, seven grandchildren, eight great grandchildren and two step great grandchildren. Lewis is a member of the Friendship Baptist Church in Hope Mills where he enjoys attending Sunday School classes and singing in the choir. 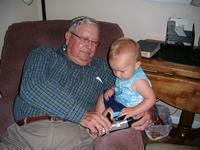 Although Lewis is very fortunate to have Medicare he has many uninsured medical expenses that are not covered. To help with these uninsured expenses a fundraising campaign has been established with HelpHOPELive, a nonprofit organization that has been helping the transplant community for 30 years. For more information, please contact HelpHOPELive at 800.642.8399.
much more! See You There. 2016 UPDATE for LEWIS: Lewis had a great 2015 and he is so grateful for his continued good health. Now almost 11 years post-transplant, Lewis spends his days enjoying his loving family; especially his 9 great-grandchildren. The newest addition, his almost 18 month-old great granddaughter, is the apple of his eye and the two of them are inseparable. Despite his good health, Lewis does have minor side-effects and setbacks as a result of his medications and immuno-suppression, but these are a small price to pay in light of his successful kidney transplant. Frequent viruses and colds are a common phenomena for Lewis, as well as multiple skin cancers and biopsies, which result in many trips to the dermatologist. Lewis continues to stay on track with his regular follow-up visits and post-transplant care, and his kidney specialist continues to balance Lewis’s medication regimen. Thank you to everyone who has supported Lewis over the years, and thank you ahead of time for your continued generosity and support. Lewis would not be where he is today without the love, support and prayers of friends and family like you. Blessings to all and Happy and Healthy New Year! Yard Sale on Friday May 1st 7:00AM to 3:00 PM and Sat. mAY 2nd 7:00AM until 3:00PM. Place- 2448 Hope Mills Road. Fayetteville, N.C.
Yard Sale– May 16th and 17th at 2448 Hope Mils Rd. Fayetteville, N.C.